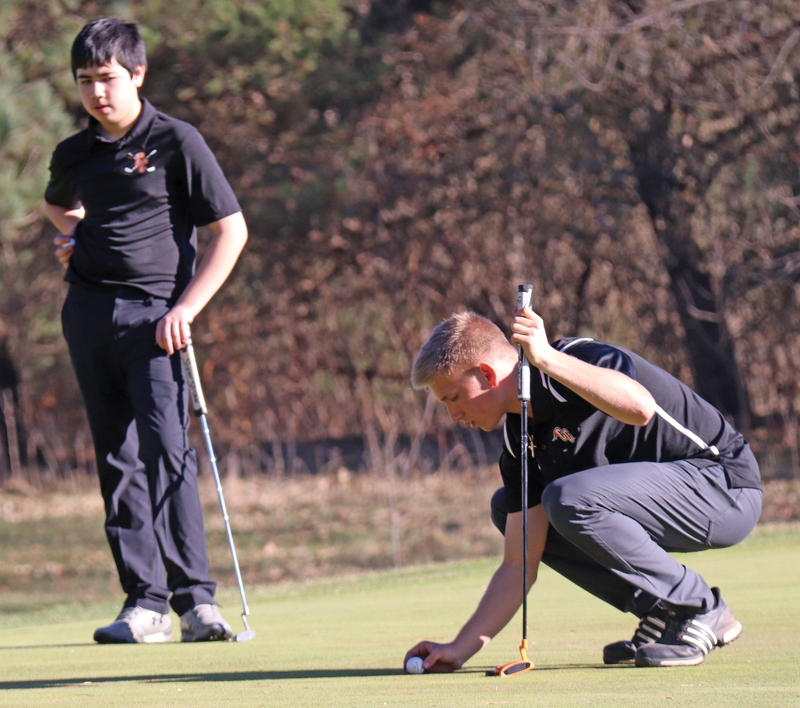 Charles City senior Jackson Molstead lines up a putt on the seventh green as Charles City freshman Trevor White looks on during Monday’s dual meet against Decorah at Cedar Ridge Golf Course. CHARLES CITY — It’s a sucker punch that everyone who lives in the midwest knows is coming. The since-vanquished winter’s parting snowball. The latest weather forecast calls for major storm conditions across the plains this week that may include snow in northern Iowa. Regardless, the start of the high school golf season has been blissful. And Monday’s Northeast Iowa Conference dual boys meet featuring Decorah and the hosting Charles City Comets at Cedar Ridge Golf Course was the exceptional no exception. Both teams have been perennial top finishers at the NEIC Championship Meet at the end of the season. Last spring, the Vikings and Comets finished 1-2, respectively. On Monday, it was Charles City which came out ahead with a 16-stroke victory (185-201). The effort put the Comets back on the winning track after losing a dual to New Hampton on Friday. It was Charles City’s first dual meet loss in two seasons — the Comets were undefeated in duals and triangular meets last season. Decorah junior Jay Fjelstal was the meet’s medalist with a 9-hole score of 42, but he was the only Viking to shoot under 50 while the Comets had four under — Jackson Molstead (43), Carter Johanningmeier (47), Atticus Parrot (47) and Trevor White (48). Two Comet junior varsity players also shot under 50 — Cade Schmidt (45) and Tait Arndt (48) — as Charles City won the JV meet 201-231. * Monday’s Top of Iowa Conference triangular at Nashua Town and Country Club featuring Nashua-Plainfield, Northwood-Kensett and Rockford had the boys meet ending with Nashua-Plainfield and Rockford tied at 199 with N-K 3 strokes behind. Rockford was led by returning state-qualifier Kaden Lyman, who shot a medalist score of 42. Nashua-Plainfield got its carded total from Drew Moine (46), Derik Auchstetter (48), Shane Hillesheim (50) and Drew Rodruck (55) — but it was Trey Nelson’s fifth score of 57 that broke the tie. In the girls meet at NTCC, Nashua-Plainfield senior Keagan Betsinger shot a medalist score of 45 to lead the Huskies to a 230-249 victory over Rockford and Northwood-Kensett, which didn’t field a full team. Abby Murray shot a 52 to lead Rockford.